Keywords: Dymola, Animation, Video, VeSyMA, Plug-in, Hybrid, Fuel Cell, Electric, Car. For demonstrating Dymola plot and animation features, in this blog post, an animation video is captured using a plug-in hybrid fuel cell electric car available in the latest version of the commercial VeSyMA library shown in Figure 1. Figure 1 – A hybrid fuel cell electric car with an automatic gearbox available in VeSyMA library. This car model is simulated with the New European Driving Cycle (NEDC). At the beginning of the simulation, the model is configured as: the battery is at 80% state-of-charge (SOC), hydrogen tank is full, and the vehicle is in EV mode. 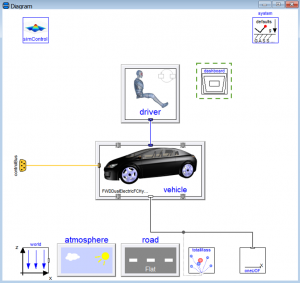 After the simulation, the dashboard model is opened in Dymola Simulation window and the animation is played while recording a video. A screenshot of this video is captured at 866s as shown in Figure 2. Figure 2 – A screenshot of VeSyMA_Dashboard animation video. In Figure 2, the Diagram window on the left side of the video shows the battery SOC, distance travelled, hydrogen tank level, speedometer and actual velocity (v_veh) of the vehicle. However, on the right-side plot window displays the target and actual velocities of the vehicle with the Dymola Measurement Cursor activated.